I first grew interested in Slavic Studies when I was an undergraduate in the early 1980s. As Ronald Reagan’s “Evil Empire” rhetoric heated up, it seemed to me that one of the best things a person could contribute at that time would be simply to learn more about the so-called enemy. Around that same time I took a class on the novels of Dostoevskii and another on 19th century Russian intellectual history. I got to write about Belinskii, Chernyshevskii, Turgenev and the “Mighty Handful” Composers. I’ve been a 19th century specialist ever since. When I started graduate school, my Russian language skills were still poor, so I began by writing about painting as a way to ease the research burden. Oddly enough, as my Russian got better I remained interested in painting. When I began to work with Abbott Gleason at Brown, he suggested I study the landscapes of Ivan Shishkin. This led me to a much larger topic on the development of Russian views of the national landscape. 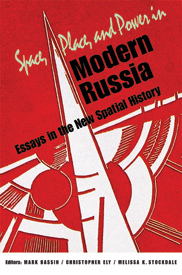 By the time I had published a book on the subject, This Meager Nature: Landscape and National Identity in Imperial Russia, partly as a result of what I had learned about the urban origins of cultural conceptions of the natural world and rural sphere, I had grown interested in urban space, which led to a co-edited volume, Space, Place and Power in Modern Russia: Essays in the New Spatial History. As I began studying nineteenth-century Russia through the lens of urbanization and public space, I grew more and more interested in the rise of revolutionary movements and their connection to cities. I intend soon to publish a study of the formation of the radical populist underground and its urban context. My current project, tentatively titled “Invisible Force: Radical Populism, Urban Space and the Rise of the Revolutionary Underground in Reform-Era Russia,” rejects the view that the radical populist movement of the 1860s and 70s was exclusively driven by ideological principles. It instead emphasizes the ways in which populism developed a disciplined and tightly organized underground movement in a dialectical process involving state oppression and the creation of methods by which to escape that oppression. In turn, in my view, underground space and its tactical advantages drove the movement toward more and more extreme measures, eventually resulting in the use of violence and hence the creation of what was, by and large, the first modern terrorist movement. Almost by accident, the populists created a method of urban insurrection that was a highly effective means of gaining attention, though as with later movements that relied on terrorism, it was never in a position to capitalize on its revolutionary aims. I have belonged to the ASEEES since I was a graduate student in the early 1990s. Without the articles in Slavic Review, the primary annual conference in our field, the newsletter, and all the connections I have made, I really can’t imagine how I would have made my way in this profession. As for outside interests, from the days of my work on nature I’m still an outdoors enthusiast and love kayaking, body-surfing, bird-watching, deep sea fishing, shell-collecting and hunting for fossils. I also play the guitar and love to travel for pleasure.